The deadly hurricane has killed at least 50 people across the Caribbean and the United States. Destroyed homes at the Seabreeze trailer park along the Overseas Highway in the Florida Keys. RESIDENTS OF THE Florida Keys ravaged by Hurricane Irma, which has left at least 12 dead statewide, discovered scenes of desolation as they returned home yesterday amid a massive operation to restore electricity to millions of people still without power in three southern US states. As emergency workers picked through the rubble, Irma’s death toll in Florida rose from an earlier figure of two. The storm has now killed at least 50 people across the Caribbean and the United States. 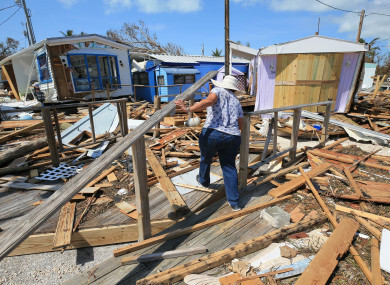 Shattered mobile homes, grounded sailboats and jumbled mounds of debris greeted Keys residents as police began lifting roadblocks to the islands following the passage of Hurricane Irma. “We don’t have much left,” Patty Purdo, a 55-year-old waitress, said as she surveyed her home in the wreckage of the Seabreeze trailer park on the island of Islamorada. European leaders visited the storm-ravaged Caribbean meanwhile amid criticism over relief efforts and the White House announced that President Donald Trump and his wife, Melania, will visit Florida tomorrow. Brock Long, director of the Federal Emergency Management Agency (FEMA), said Irma caused major damage in the Keys, a 195-kilometre string of islands off Florida’s southern coast known for boating, scuba diving and fishing. 90% of the archipelago’s homes have been destroyed or significantly damaged he said. The islands had been all but cut off since the storm struck early Sunday as a Category Four hurricane, and bore the brunt of Irma’s damage while the rest of the Sunshine State fared relatively better. “Most areas are still without power and water. Cell service is spotty. And most gas stations are still closed,” authorities in Monroe County, which includes the Keys, said in a Facebook post. With over 15 million people without electricity in Florida, one million in neighbouring Georgia and 20,000 in South Carolina, authorities launched a massive effort to restore power. “We’re having over 30,000 individuals from out of state helping us get our power back on,” Governor Scott told reporters while touring flood damage in the northeast city of Jacksonville. Scott said the authorities had rescued more than 300 people in Jacksonville, a city of 880,000 hit by flooding on Monday. As much of the state struggled with power outages and gas shortages, Walt Disney World in Orlando reopened after closing for the hurricane, as did Disney’s other theme parks – Epcot, Animal Kingdom and Hollywood Studios. Katherine Tenea, who traveled to Disney World from Tampa, Florida, with a friend said she had been “cooped up in the house for three days” and looked forward to being able to “stretch out and hang out”. Before reaching the United States, Irma tore through a string of Caribbean islands, going from tiny Barbuda yesterday to the tropical paradises of Saint Barthelemy and Saint Martin, the US and British Virgin Islands, Puerto Rico, the Dominican Republic, Haiti and the Turks and Caicos Islands. Amid frenzied relief efforts, a nun’s habit stood out amid a sea of uniformed first responders. “There was a need and I did what I could to help out,” Sister Margaret Ann told CNN after she took a chainsaw to cut through a downed tree that blocked a road in the Miami suburb of West Kendall. An incredulous off-duty police officer shared video footage of the nun in action which went viral on Twitter. French President Macron and Britain’s Foreign Secretary Johnson meanwhile visited their nations’ hurricane-hit Caribbean territories. The region was the worst-hit of one of the most powerful storms on record as residents and holidaymakers became increasingly desperate. Macron’s plane touched down in Saint Martin as anger grew over looting and lawlessness in the French-Dutch territory. “He needs to come to look around, so that he realises the horror here,” local resident Peggy Brun told AFP. The French, British and Dutch governments have faced criticism for failing to mobilise resources for the storm which was forecast days in advance. Speaking in Guadeloupe, Macron insisted French authorities were as well prepared as they could have been. While touring Saint Martin, Macron was at times jeered by people waiting for aid supplies or hoping to catch flights for France in order to escape the devastation across the island. Johnson was visiting the British Virgin Islands and Anguilla, where Britain has sent nearly 1,000 military personnel to help both with security, and what he described as an “unprecedented” relief effort. British junior foreign minister Alan Duncan told parliament that 100 high-risk prisoners escaped in the territory during Hurricane Irma, which threatened a “complete breakdown of law and order.” He did not disclose how many were still at large. Email “Hurricane Irma destroyed or 'significantly damaged' 90% of homes on Florida Keys”. Feedback on “Hurricane Irma destroyed or 'significantly damaged' 90% of homes on Florida Keys”.